The DS3612xs is much bigger than the TS-879 Pro for the simple reason that is supports four more 3.5" drives. It measures 310mm (H) x 300mm (W) x 340mm (D) (12.20" x 11.81" x 13.38") and weighs 10.53kg (23.21lbs) empty. 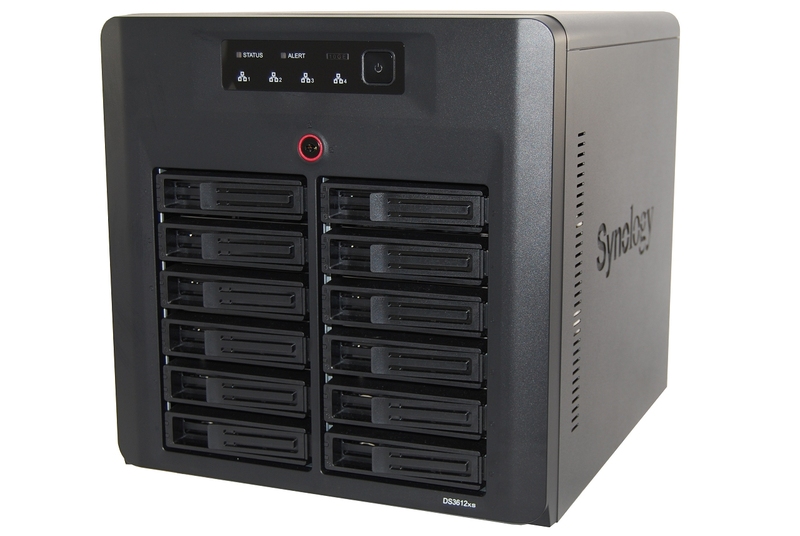 With twelve drives installed, Synology says the DS3612xs generates just 29.4dB when operating and consumes 132 watts. It's also quite easy to get inside the DS3612xs and install a 10GbE network card, requiring the removal of two case screws. Unlike the TS-879 Pro, the DS3612xs accepts cards with a low-profile bracket and doesn't need its own custom bracket, which helps improve compatibility. While it's apparent from the outside that the DS3612xs is around 40% larger than the TS-879 Pro, the difference is even more obvious when you get inside. 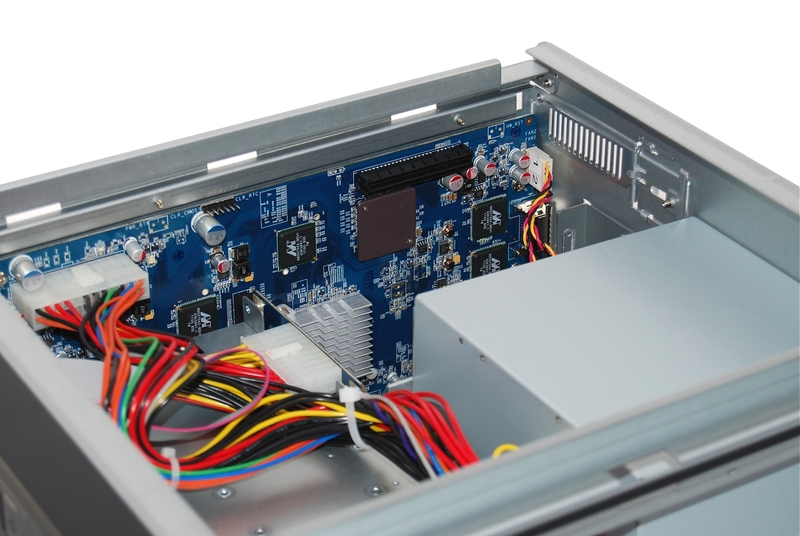 The DS3612xs uses a standard ATX power supply while its Core i3 is cooled using a tower-style heatsink. 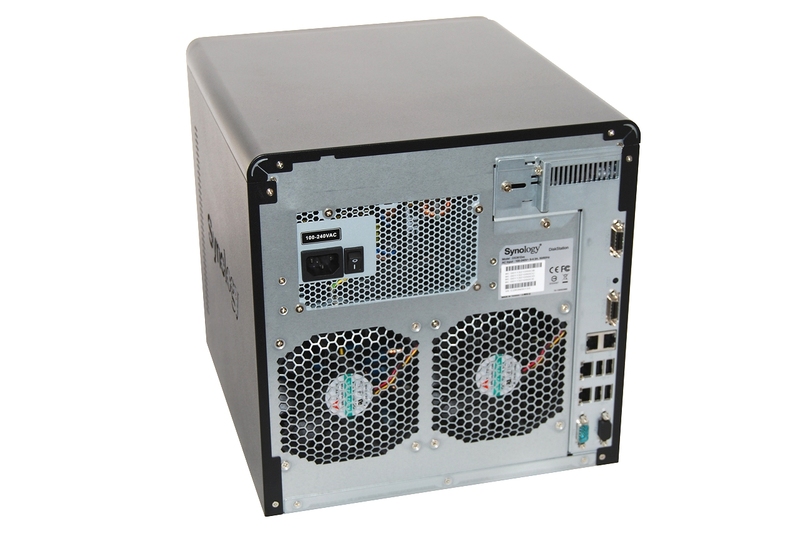 The DS3612xs is powered by a Seasonic SS-500ET 500w PSU, which is bronze 80 plus certified and retails for roughly $60. 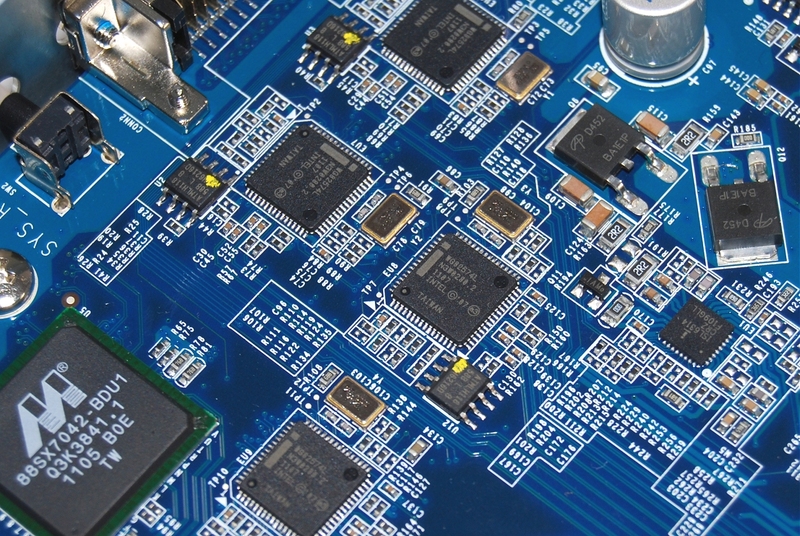 However, replacing this part is not as simple as just buying an SS-500ET online, as the DS3612xs uses a custom version without SATA or Molex connectors. Stripping the DS3612xs down reveals two large blue PCBs: a motherboard and a hot-swappable SATA module with a dozen ports. 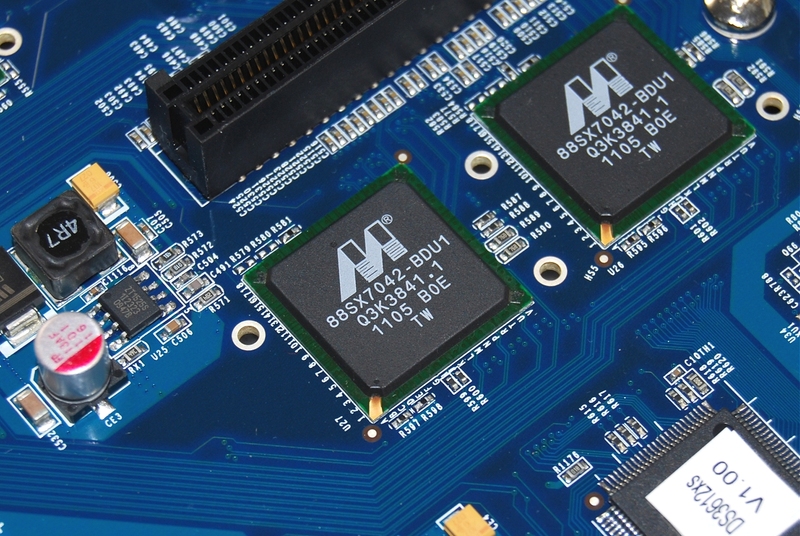 However, unlike the QNAP TS-879 Pro, SATA controllers aren't on the SATA module. 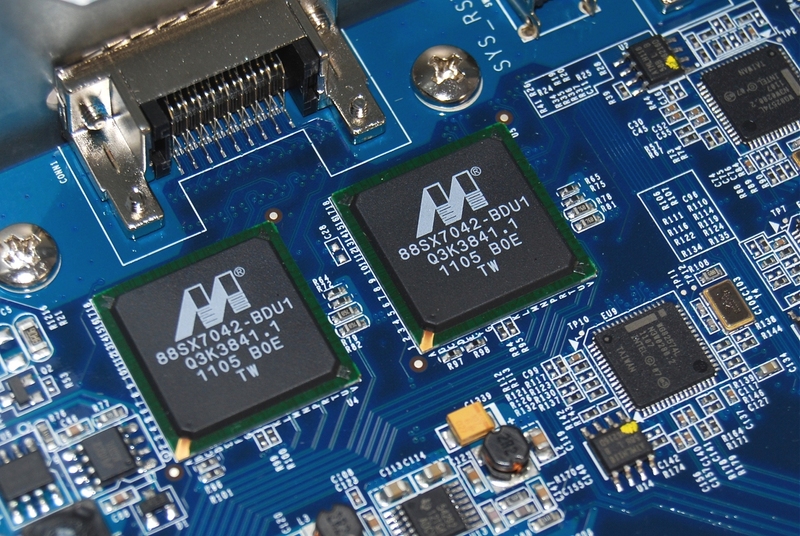 The motherboard has five Marvel 88SX7042 controllers, with each supporting four SATA 3Gb/s ports using the PCIe bus. For the most part, NAS devices such as the DS3612xs will be outfitted with hard drives that can't exhaust the 3Gb/s interface, but we're still disappointed that such an expensive unit lacks 6Gb/s support. In case you're wondering why a twelve-drive NAS has five SATA controllers supporting up to 20 drives, the reason is pretty straightforward: future expansion. 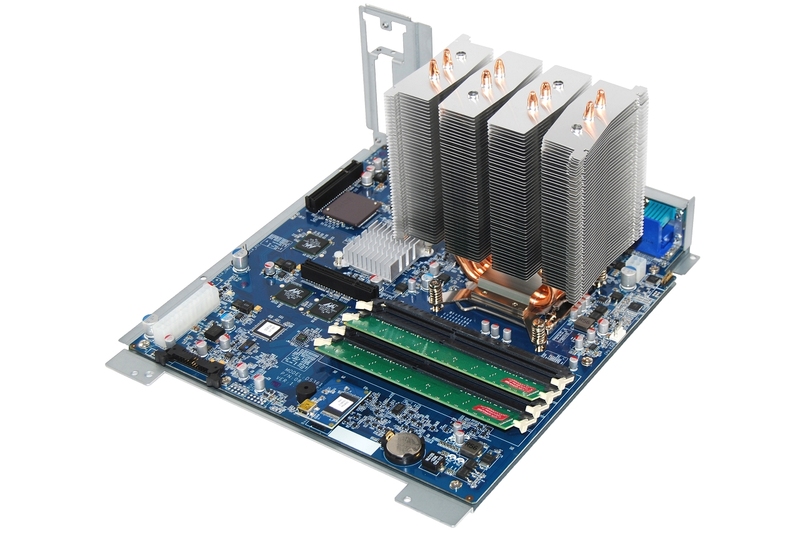 Three of the five 88SX7042 chips power the NAS' twelve hot-swappable SATA ports, while the other two controllers are for two InfiniBand ports that connect the DS3612xs to DX1211 expansion units for a total storage capacity of 100TB. The Core i3-2100's heatsink measures 140mm tall, 130mm long and 85mm wide (5.51" x 5.11" x 3.34") and features four dual copper heatpipes. 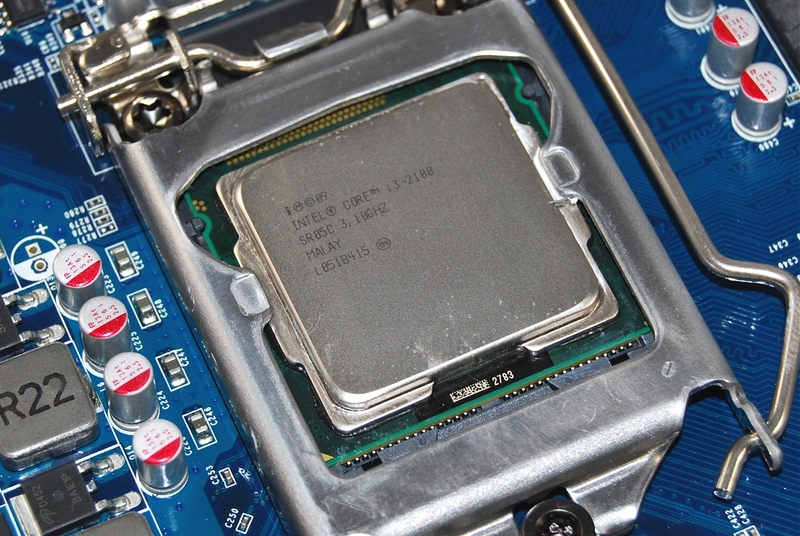 The 32nm Sandy Bridge chip itself features two cores with four threads via Hyper-Threading, it operates at 3.1GHz (200MHz slower than the TS-879's i3-2120), and it has a 3MB L3 cache, HD 2000 Graphics and a 65-watt TDP. As with QNAP's device, upgrading the CPU will void your warranty. 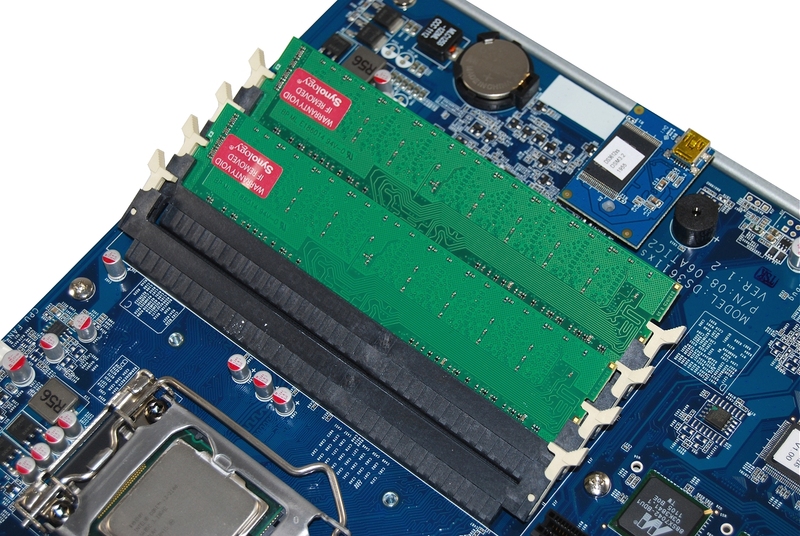 Opposite the processor are not two but four DDR3 DIMM slots which come with a pair of Apacer 75.073C8.G020C DDR3-1333 1GB memory modules for 2GB of RAM. It's possible to upgrade the DS3612xs to 4GB or even 6GB of memory using the ECC Memory upgrade kit, or you can buy 2GB of ECC memory for as little as $20. We're not sure what Synology is charging for its official upgrade kits, but it's probably more than etail. You won't find USB 3.0 or any front panel connectivity on this $3,500 NAS. Instead, there are four USB 2.0 ports at the rear. Granted, USB 3.0 and front panel connectivity are more essential for home users, we're still bummed to see them missing on such an expensive product. However, Synology has upped the ante in network support. 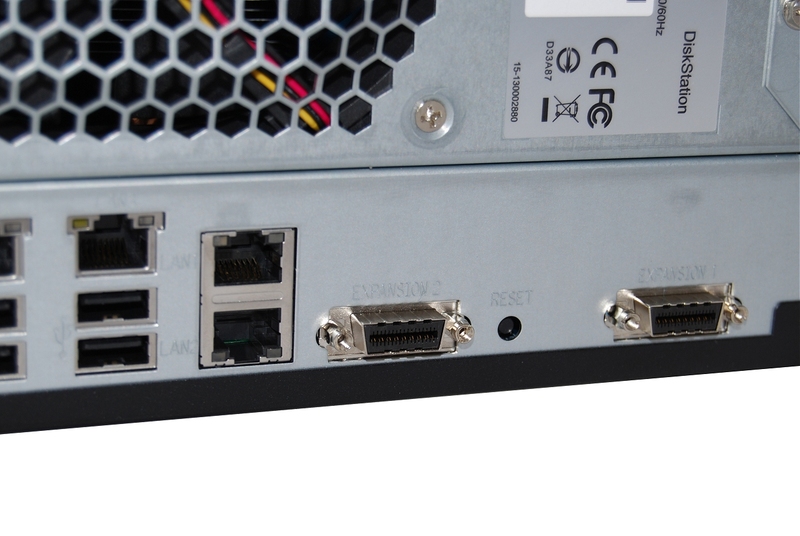 Besides 10GbE, the DS3612xs supports four Gigabit Ethernet ports right out of the box. Whereas the TS-879 Pro has one WG82574L controller, the DS3612xs boasts four, meaning two pairs of link-aggregated ports can be configured. 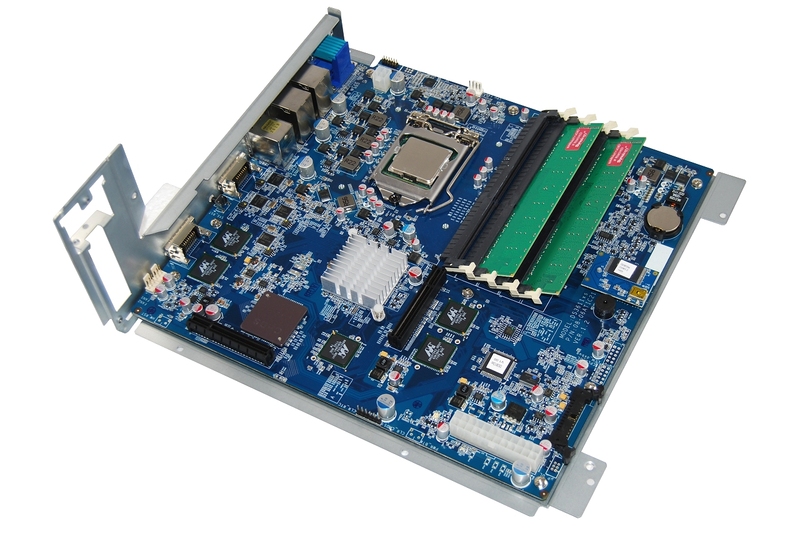 The I/O panel has a pair of InfiniBand ports, four USB 2.0 ports, four Gigabit Ethernet connections, a COM port and VGA, though the display output is reserved for system maintenance.